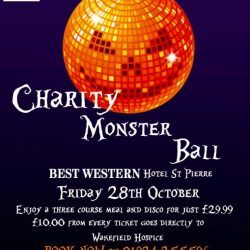 We are so pleased to be supporting the Charity monster Ball, in aid of The Wakefield Hospice. We are donating our services for this event to help raise money for this worthy cause. We have been working with our lighting to create the perfect Halloween atmosphere. Hotel St Pierre is providing a three course meal and Monster disco for just £29.99. Please come along and show your support, £10 from every ticket goes to The Wakefield Hospice. The people that work here are committed to providing the highest level of symptom management & care for people who have advanced active, progressive & life threatening illness. The hospice holds various events in aid of fund raising so check out the link to see how you can help https://www.wakefieldhospice.org/Events.